1.3 Habitat and distribution: Where to find guanabana trees? 1.8.1 AMOUNT PER 100 G.
Spanish: Guanábana, graviola, guanaba, guayabano, guyabano, huanaba, masasamba,zopote de viejas, catoche, anona, yabana, sinini, anón. Etymology: Muricata is called to the plants with loose spines that barely prick, as it happens to the surface of this fruit. Habitat and distribution: Where to find guanabana trees? tropical plant native Central America, widespread in the Caribbean islands and southern Africa. Currently you can find it in tropical West Africa, India, Sri Lanka, China, Polynesia and Australia. Evergreen shrub 5 to 9 m. high. Oblong or elliptical hard leaves 5 – 15 cm. long; 6 cm. wide, dark green on the underside and yellowish on the reverse. Solitary flowers 2 to 3 cm. They are growing in the branches or on the same trunk. Soursop fruit is the largest one in all the trees of the guanabana family. Hunch shaped or oval, measuring up to 40 cm. in diameter and can weigh up to 2 kg. Its surface is bright green and it is characterized by the presence of more or less distinctive spikes or spines. The interior is very similar to a cherimoya, showing a white pulp and many flattened ovoid seeds, separated by carpels. Its texture is soft and juicy, with sour taste. The seeds, leaves, and to a lesser extent, the fruits contain acetogenins (there have been detected more than 50 acetogenins in the plant), with different properties against cancer. These compounds inhibit the growth of tumor cells and stimulate natural death (apoptosis), reason why thisplant is being studied as a possible aid in the treatment of cancer. They also have anti-malarial properties. Its mechanism of action is involved in the inhibition of complex I (NADH-ubiquinone oxidoreductase), which blocks the nutrition of the tumor cells and malarial parasites. It contains alkaloids, such as anonaine and anoniíne, and cardiac glycosides. Essential oil rich in caryophyllene (13.6%), delta-cadinene (9.1%), epi-alpha-cadinol (8.4%) and alpha-cadinol (8.3%). Edible Food: It can be consumed fresh, whole fruit or in fruit salads. But it can be somewhat acidic, and it is typically used primarily for the production of soft drinks, such as juices, smoothies, ice cream, sorbets or slush. For these purposes the processed soursop is sold in the form of natural soursop pulp and frozen custard apple concentrate, jams, juices, jellies and purees. In Indonesia, the unripe fruit is cooked in soups. Graviola shell pieces are fried in Brazil. Insecticide: The seed powder is antibiotic and insecticide. It is used in gardening against aphids, grubs and beetles. The seed oil is effective against lice. 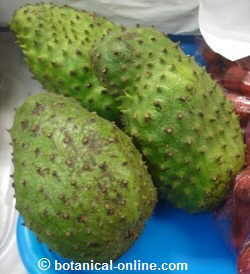 Medicinal properties of soursop: Given the health benefits it can offer, it is being used in many applications. in fact, it was already mentioned in prehispanic medicine by people of Central America. It is astringent, digestive, colagogue and fights constipation. Infusions of the root and leaves are used against intestinal worms. Scientific studies have shown that the seeds, leaves, and to a lesser extent the fruit are rich in acetogenins, substances that fight hypertension, diabetes and have anticancer properties.